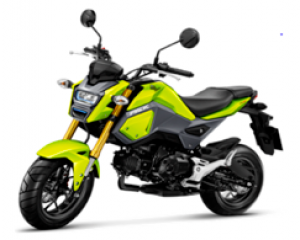 Since the launch of the MSX125 in April 2013, the Mini Street X-treme has received a cult following from customers. It’s quirky, fresh and fittingly unconventional styling makes it the perfect 125cc bike for new riders. In terms of performance, build quality and usability it is everything you would expect from a Honda but with a unique style and attitude all of its own. The MSX125 is part mini-bike, part motorcycle with engaging performance, smooth handling and styled with a sense of fun! It has a tough looking exterior and urban edge… But don’t be fooled, it’s not as small as it looks! We are pleased to announce that we will be releasing a newly revised 16YM MSX125 in the UK in early summer. A thorough redesign gives the MSX125 an even sharper new attitude with more of a ‘mini street-fighter’ appearance. * Please note that the figures provided are results obtained by Honda under standardised testing conditions. Tests are conducted on a rolling road using a standard version of the vehicle with only one rider and no additional optional equipment. Actual fuel consumption may vary depending on how you ride, how you maintain your vehicle, weather, road conditions, tire pressure, installation of accessories, cargo, rider and passenger weight, and other factors.